This is one of a set of very simple charms that can serve as a basic invocation for a solitary High Day. It could be inserted in a ‘Simple Rite of Offering’ as the key offering section, perhaps serving all the way through the Prayer of Sacrifice, but it could also be used with little or no other ritual context. Just build a good small fire, or gather candles and a censer, and have a well-bowl of some sort. These charms could even be adapted for use by a family at their High Day dinner table. 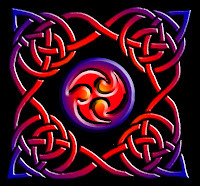 I keep the Feast of Bealtaine! And grant your blessing to my year. So, all you Powers, I give you welcome at my Fire. Let your light be reflected in my spirit, let your ale flow in my veins. I raise this glass to you, and drink to your divine power. Let me know the health, wealth and wisdom of the Gods and Spirits on this holy feast of Bealtaine! So be it! It is best to find a flowering tree on which to tie the three clouties. The clouties can be as slight as three threads, though strips of cloth are better. These should be in three colors as you prefer. The offerings to the Deities can be oil or incense as usual.